One of the most popular shows that are still running on Nickelodeon is the show about a girl who has her own web show called iCarly. To no surprise that girls name is Carly and along with her two best friends Samantha and Freddie the three produce their own popular web show. The three always seem to have something fun and exciting going on both on and off the show. The character of Carly Shaw has taken America by storm and there are now many mid-teen girls that want to dress like this fictional character. • Casual look: Carly likes to go for jeans and a t-shirt in this type of dressed down style. She will usually dress this way on the show when the three teens are just hanging out and the environment is more casual. To get this look, go for a pair of form fitting, but not tight, blue jeans and really any cute t-shirt that you like. Carly will often wear a light sweat jacket over her shirt and it usually has a hood. For footwear you can go with a nice pair of dress flats or you can even go with white sneakers if you are more comfortable doing so. Accessorize with a simple watch and conservative earrings and you got the casual look pinned down. • Web show look: Here Carly tends to get a little more on the dressy side. She will shed the sweat jacket for a more fancy style jacket and will usually change the shirt as well. Go for a nice long sleeved shirt or even a half sleeved button down. 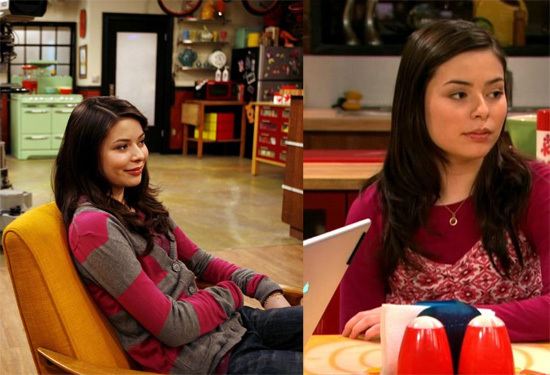 Carly usually goes with brighter colors when doing iCarly like reds and oranges. She only wears the dress flats on the show and she really doesn’t add anything in the way of extra accessories when on the web show. • Dresses: When the television show takes the three friends outside of the home, Carly often sports a wide variety of fun sundresses. She again sticks with brighter and more cheery colors and can either be spotted wearing those same dress flats or a nice pair of pumps with a very short heel. Because the show is a kid’s show, the dresses are never too short and typically come down to about her calves. • Hair and make-up: When doing your hair, do it typical Carly fashion and part it on one side and then simply wear it down. Carly will also sometimes add a little curl to her hair so feel free to break out the curling iron and give your hair some loose curls if you want to. When applying your make-up try to stay on the natural looking side and don’t go with dark colors. Carly likes to use pinks when it comes to her lips, but never anything that is too attention grabbing. Once you have pegged the iCarly look, go out and recruit some friends and maybe you too can make your own web show. I lovre carly she is so sweet and organized and beautiful haha she is a great role model thanks for everything….. I carly rocks!!!! I don’t really like Carly. I just like her outfits. But she doesn’t really dress casual, she always has a poofy blouse or some bright colored sneakers. And she wears lots of jewlery. This artical is totally bogous!